If you want to get a refreshing stuff between your activities, then these products are your answer. There are so many things that can become a good for your spare time, but there is nothing that can beat eating a delicious snack after a tiring work. Here are two snacks which probably will motivate your daily activities, Larabar and Clif Bar. Like its name, Larabar is a snack in shape of a bar. The approach that it takes is a versatile one. Larabar is not only emphasizing in its taste, but it also thinks about your health and also people’s favors. On the other hand, Clif Bar is also a bar snack. This bar has a lot of versatile functions. This bar will fit for you who loves a heavy and tasty stuff for your snack time. So if you are interested in both products, let’s see the comparison below. The most important thing about snack is its flavor. Larabar is providing the people’s demands very nicely. It gives so many options in flavors, start with the pecan pie, apple pie, blueberry muffin, cashew cookie, until the chocolate chip brownie flavor. These many options in flavors make it very easy to attract the customers as usually everyone loves different taste food. On the other hand, Clif Bar is a very organic bar which has ingredients like rolled oats, roasted soybeans, and even organic honey in it. Clif Bar probably wants to make a very healthy and appetizing snack. There are also many flavors included in it which are more or less the same like Larabar. If you want to have a diet, then Larabar can be used for this purpose. But you need to change your meal with this product. The fruit flavor is probably the best choice for you who wants to lose some weight. After that, Larabar is also very fit to be used as energy snack. Even though tt is not a very heavy food, but the nutrition inside is more than enough to strengthen you throughout the day. On the other hand, Clif Bar is probably targeting for the athletes as the contents inside are pretty heavy with a significant amount of carbohydrate and calories in it. You can find that this product is also pretty good used to prevent harmful diseases. The ingredients like almond and oat are what make Clif Bar pretty healthy and fantastic energy booster. You will probably won’t need to consume any food after consuming this. Though the minus point is that Clif Bar can cause you a weight gain if you are too lazy to get a workout while keep eating this snack. In this case, both products are both well made, and both of them are having their own abilities. 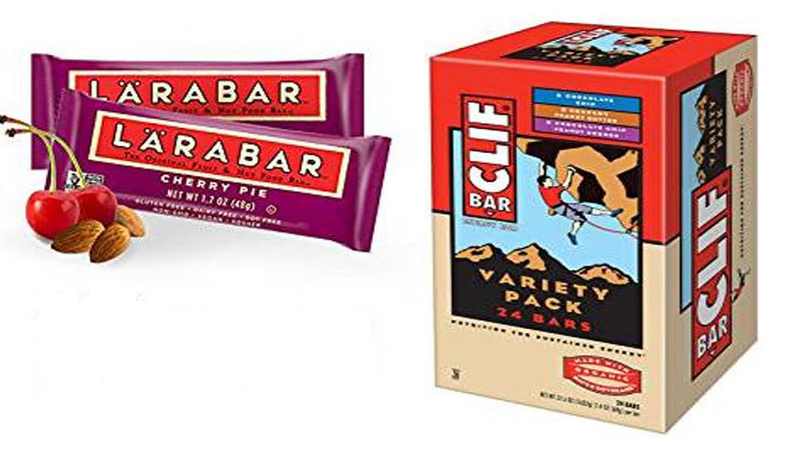 Larabar is best used for the diet and energy booster, whereas Clif Bar is best used as the meal substitution, healthy snack, and energy booster snack.